Nestled in between two mountain ranges in Northern Kenya sits the world’s largest wind farm, by number of turbines. 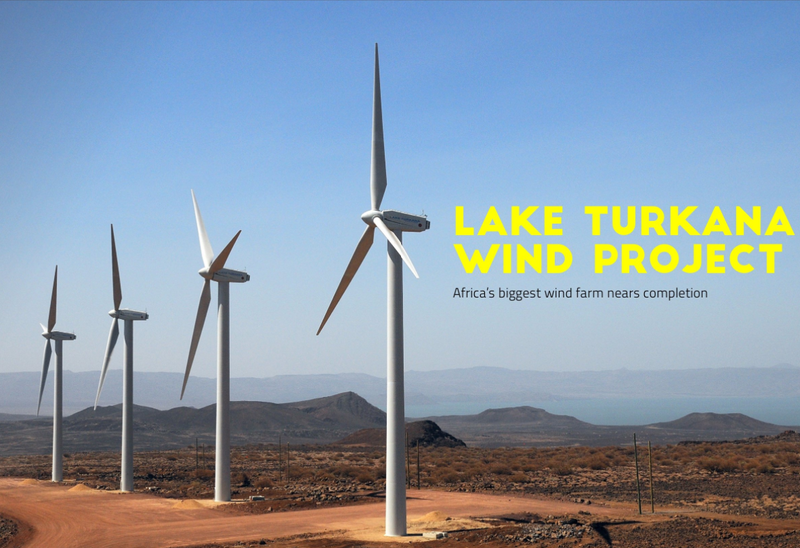 The Lake Turkana Wind Power project (LTWP), which will power a million Kenyan homes, is set to be completed in July 2017 and is going to have a transformative effect on the Kenyan energy landscape. While the country has little in oil reserves, and has not typically relied on fossil fuel consumption like some other African countries, the government is leading a programme to bring electricity connectivity to at least 65% of the population by 2022. Once fully commissioned the LTWP, the largest single private investment in Kenya’s history, will supply 16% of the country’s total energy production capacity, a huge number by any means. It will serve as a blueprint for how big investors can take such projects across the continent and could be the beginning of large scale wind energy delivery for millions of Africans. The man who has overseen the delivery of this mega-project, the LTWP general manager Phylip Leferink, is particularly proud of how the wind farm will be delivered on time and on budget. It is impressive when you consider the sheer complexity of delivering 365 wind turbines to a remote area in Northern Kenya with zero available infrastructure from the outset. Leferink says it was the painstakingly thorough planning that the project team undertook in the nine years before construction which secured the project’s success. “The logistics were very challenging, for example all the wind turbines had to be transported from Mombasa which is 1,200km from the site. But we were able to stay on track with the project because we planned it meticulously. Planning is key in a project like this,” stresses Leferink. “The development stage took quite a long time but it gave us the opportunity to think the whole project through and we only succeeded because the planning was so good. The wind farm is made up of 365 Vestas wind turbines, each with a capacity of 850kW, and a high voltage substation which will be connected to a transmission line currently under construction by the Kenyan government. There are two key elements to the LTWP project; firstly the size of the project, with 365 wind turbines it is the largest wind farm in the world by number of turbines and secondly the location of the project. The strategic geographical location has strong, consistent winds that are almost unique in the industry. “There are wind speeds of more than 11m per second which in the wind industry is totally unheard of. The wind is very strong. It is predictable 98% of the time and that is because of the geographical location of the project,” Leferink says. It poses the question of what having such a strong wind blowing the turbines round means for the energy generation. Well, it is only good news for the project. A strong and consistent wind increases the capacity factor of the LTWP project. The capacity factor is a calculation of the average power generated by dividing the total electricity generated by the number of hours operating. Leferink says that wind farms in Northern Europe with low wind speeds generally have a capacity factor around the 30% mark, whereas LTWP will be double that at over 60%. “To have a capacity factor of more than 60% is unique in the wind industry, it makes it a very efficient wind farm,” says Leferink. However, despite the strengths of the location in terms of the strong and consistent wind, the remote area threw up a number of challenges when it came to the construction phase. Prior to the project the location was very remote, so much so Leferink compares it to an offshore rig. There was zero available infrastructure and every element had to be built from scratch. That crucial work was completed by a team of highly qualified contractors which Leferink says were fundamental to the success of LTWP. Danish wind turbine manufacturer Vestas built and supplied all 365 wind turbines for the project, Siemens was responsible for all the electrical infrastructure; the substation, the internal connection grid and the individual transformers for each turbine. Chinese company Rongxin Power Electronic (RXPE) delivered a crucial Statcom system which bridges the gap between the Kenyan grid and the Lake Turkana wind farm. Leferink explains that the Kenyan grid can sometimes be erratic and therefore it is imperative to have this kind of Statcom to smooth the interface between the two systems. LTWP also relied on two Kenyan contractors to deliver key infrastructure necessary for the project to become operational. They had to build a lot of roads on and off site, and Civicon altogether laid nearly 350km worth of new roads for the project. Then Mombasa-based SECO built all of the housing units and facilities for the management and staff on the project. The project is being funded and led through the LTWP consortium comprising of KP&P Africa B.V and Aldwych International as co-developers, Investment Fund for Developing Countries, Vestas Eastern Africa Limited, Finnish Fund for Industrial Cooperation Ltd, KLP Norfund Investments AS and Sandpiper. “Our funders see this is as a landmark project in Africa, the complexity of the project and the amount of money being invested makes it unique for Kenya and Africa,” asserts Leferink. Leferink says that the project has also had extremely encouraging support from the government. The backing from government has gone beyond fast tracking the permitting stage. Leferink believes the LTWP has paved the way for substantial growth in the independent power producer industry in Kenya. As well as being very successful from a commercial and operational perspective, LTWP has also had a big influence on the local area through its community engagement. The company launched a foundation called Winds of Change to pursue CSR policies in three key areas; health, water and education. Winds of Change has built a number of drug dispensaries, maternity clinics and other medical buildings for the local population. It has also made a huge effort to supply fresh water to the community through several water projects including pipelines, bore holes and long term projects to supply sustainable water to local groups. The CSR foundation has also been able to change the lives of local children through its work in education. By building dormitories in local schools where children often travel huge distances to reach, Wind of Change’s work means the kids can stay over at the school and mean they no longer have to travel 40-50km back and forth from school. Looking forward, the project team are in the final stages of construction to be ready in July and then as soon as the transmission line, being built by the Kenyan government, is completed, the LTWP can be fully commissioned and begin to supply clean energy to a million Kenyan households and play a big role in the Kenyan government’s Vision 2030 goal of 23,000MW new energy generation capacity.